- Superhero Wars Ω -Advent of Cosmoman!- is the 1st S Ultimate Booster released in the Japanese and English Format. - Includes further support for Hero World. - Each pack includes 7 cards, RR or greater is guaranteed per pack (but no two RRR in one pack), and also there may be the foil version of any R/U card. - Includes a new type of rarity, Premium Rare (SS) which are cards are signed by the voice actors. - Introducing a special booster dedicated to everyone's favorite "Hero World!" - Introducing new attribute to Hero World: Battle Building, Mobile Aerial Team, Weaponry, Galaxy Exalt and Galaxy Defense Team. 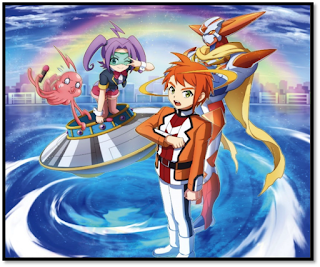 - Featuring decks built around 'Cosmoman' buddy of a new character from the anime named Mamoru! - Grab hold of victory with various Superhero gimmicks! - Furthermore, this pack will highlight a new deck build catering to advanced fighters! - Let's not forget about power-ups for existing Hero World decks with Darkhero, Brave Machine, Battleship, Superheroine, and so on! - Introducing two new keywords: Weaponry Link and Purge. - This card gets all abilities of 《Battleship》in its soul. - All souls of this card cannot be put into the drop zone by your opponent's card effects. - At the beginning of each player's attack phase, you may call a 《Crew Trooper》 from this card's soul by paying its [Call Cost]. - When you [Transform] into this card, put the top three cards of your deck into its soul. - This card gets defense+1000, and critical+1 for each card in its soul. - At the end of your turn, return this card from the field to your hand. - When this card enters the field or you [Ride] into this card, you gain 2 life. Then, if it entered the field or you [Ride] it by the effect of a 《Battle Building》, you gain 3 life! - If you are [Ride] into this card, reduce the size of all 《Battle Building》 monster on your field's by 3. - If the number of cards in its soul is one or less, this card gets [Weaponry Link]. - When a soul is put into this card, you gain 1 life! - This card on your field cannot be destroyed by your opponent's card effects. -【Act】If you are [Ride] on a 《Battle Building》, drop the top three cards of your deck, put up to one size 3 or greater monster and up to one spell from among them into your hand. You may only use this ability once per turn. - You may only cast this card if you have an item equipped. - Look at the top three cards of your deck, put a card from among them into your hand, and put the rest into your gauge. You may only cast "It's Hero Time!!" once per turn. - When this card enters the field, put up to one «Battle Building» spell card, except "Cho-Tokyo, Sky Tower", from your drop zone to your hand. Then, if it enters the field by the effect of a 《Battle Building》, put the top two cards of your deck into your gauge. - If this card is attacking alone, its attack cannot be nullified. - When this card enters the field or you [Transform] into this card, put the top three cards of your deck into its soul. 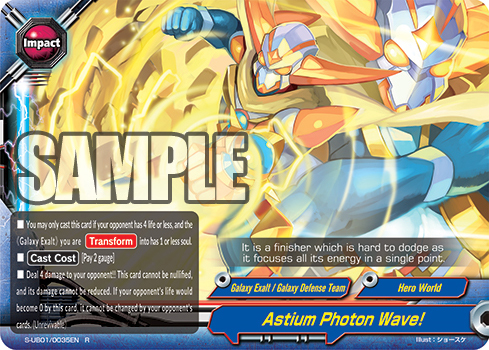 - 《Galaxy Exalt》 you are [Transform] into cannot be [Rest] by your opponent's card effects, and get [Penetrate]! At the end of your turn, return this card from the field to your hand. - When this card enters the field or you [Ride] into this card, put up to one 《Weaponry》from the deck in to your hand, and shuffle it. - If you are [Transform], nullify all abilities of your opponent's monster that is in battle with this card. This ability cannot be nullified. - If this card attacks and destroys your opponent's monsters, draw a card. - 【Act】 You may discard a 《Galaxy Defense Team》 from your hand. If you do, look at the top five cards of your deck, put up to one 《Galaxy Defense Team》and up to one 《Galaxy Exalt》 from among them into your hand, and put the rest on the bottom of your deck in any order. You may only use this ability once per turn. - When this card enters the field, you may put a 《Weaponry》 from your drop zone into the soul of a 《Mobile Aerial Team》 on your field. - Discard up to one «Battle Building» from your deck, put up to one 《Battle Building》 spell card with [Set] into your hand, and shuffle your deck. You may only cast "Start Up! Battle Building" once per turn. - Put up to one size 3 《Mobile Aerial Team》 monster and up to one 《Weaponry》 from the deck into your hand, and shuffle it. You may only cast "Infonet Operation" once per turn. - You may only cast this card if you are [Transform] into a 《Galaxy Exalt》. - [Counter] For this turn, damage dealt to you are reduced to 1. - You may only cast this during an attack on your opponent's turn and if you have a 《Battle Building》 on your field. - [Counter] Nullify that attack, put the top card of your deck into your gauge and gain 1 life. Then, if you have 3 or more 《Battle Building》 on your field, draw a card. - At the beginning of your turn, draw a card. - [Counter] 【Act】 Pay 1 gauge. If you do, call or [Ride] a "Friendship Combine, Aiborg" from your hand or drop zone without paying its [Call Cost] or [Ride] cost. Then, put this card into its soul. - If this card is in the soul of a 《Mobile Aerial Team》, that card gets defense+3000, and all cards on your opponent's field get critical-1! - [Counter] 【Act】 During your opponent's turn, you may put this card from the hand into the soul of a 《Mobile Aerial Team》 with [Weaponry Link] on your field. If you do, draw a card. - When this card enters the field, draw a card. Then, if it entered the field by the effect of a 《Battle Building》, choose a card on your oppnent's field, and for this turn and the next turn, the chosen card cannot [Stand]. 《Battle Building》 other than this card on your field get power+5000! - If you are [Transform] into a 《Galaxy Exalt》, reduce the size of this card on your field by 3. - When this card enters the field, destroy a monster on your opponent's field. Then, if it entered the field by the effect of a 《Battle Building》, destroy a card on your opponent's field. - All 《Battle Building》 on your field cannot be destroyed by your opponent's card effects. - You may only call this card if you are [Station] at a card. 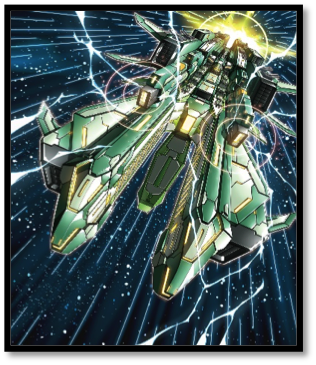 - When this card attacks, you may put a card from your hand into a soul of a 《Battleship》 on your field. If you do, you gain 1 life and draw a card. -【Act】 You may discard this card from your hand, and pay 1 life. If you do, put up to one 《Battleship》 from your deck into your hand, and shuffle your deck. - When this card enters the field, put the top card of your deck into your gauge, and you gain 1 life. Then, if you are [Transform] into a 《Galaxy Exalt》, draw a card. - If there is a 《Weaponry》 in its soul, this card gets power+3000, defense+3000, and critical+1! If the number of cards in its soul is 0, this card gets [Weaponry Link]. - When this card enters the field, if you have another 《Mobile Aerial Team》 on your field, put the top card of your deck into your gauge, and draw a card. - If the number of cards in its soul is 0, this card gets [Weaponry Link]. - This card can only be called to the left. - The gauge cost written in the [Call Cost] and [Transform] cost of 《Galaxy Exalt》 is reduced by 1 gauge. - Souls in all 《Galaxy Exalt》 on your field cannot be put into your drop zone by your opponent card effects. - You may only cast this card if you have a 《Galaxy Defense Team》 on your field. - Draw a card. Then, if you are [Transform] into a 《Galaxy Exalt》, draw a card. You may only cast "This is the Key of Justice!" once per turn. - You may only cast this card if you have a 《Mobile Aerial Team》 on your field. - Draw a card. Then, if there is one or more cards in the soul of a 《Mobile Aerial Team》 on your field, draw a card. You may only cast "Two-Man Cell" once per turn. - Put four cards from the top of your deck into your gauge. You may only cast "Hyper Energy" once per turn. - [Counter] Destroy a card on your opponent's field. - You may only cast this card during an attack on your opponent's turn, and you have a 《Mobile Aerial Team》 on your field. - [Counter] Nullify the attack. Then, If you are [Ride] into a 《Mobile Aerial Team》 with two or more souls, put the top two cards from your deck into your gauge, and you gain 2 life! - At the beginning of your turn, you may put the top three cards of your deck into your drop zone. If you do, put up to one 《Battle Building》 spell from among them into your hand. - [Counter] 【Act】 Pay 1 gauge. If you do, call a "Super Tokyo, Sky 3" from your hand or drop zone without paying its [Call Cost]. Then, put this card into its soul. - At the beginning of your turn, you may put the top two cards from your deck into your gauge. - [Counter] 【Act】 Pay 1 gauge. If you do, call a "Sky War Records, Big Cybird" from your hand or drop zone without paying its [Call Cost]. Then, put this card into its soul. - If this card is in the soul of a 《Mobile Aerial Team》, that card gets power+3000, critical+1, and [Penetrate]! - [Counter] 【Act】 During your turn, you may put this card from the hand into the soul of a 《Mobile Aerial Team》 with [Weaponry Link] on your field. If you do, draw a card. - You may only cast this card if your opponent's life is 4 or less, and you are [Transform] into a 《Galaxy Exalt》 with one or less soul. - Choose a 《Mobile Aerial Team》 on your field, and put up to two 《Weaponry》 from your drop zone into that card's soul. Then, [Stand] the chosen card, and that card can also attack during this final phase. - When this card enters the field, for this turn, the next damage dealt to you from attacks is reduced to 0. Then, if it entered the field by the effect of a 《Battle Building》, draw a card. - Damage you take are reduced by 1. - When this card enters the field by the effect of a 《Battle Building》, for this turn, this card gets [Triple Attack]. - If you are [Ride] into a 《Battle Building》, all 《Battle Building》 on your field cannot be [Rest] by your opponent's card effects, and get critical+1! 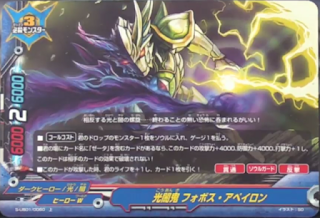 - When this card attacks, if you are [Transform] into a 《Galaxy Exalt》, destroy a card on your opponent's field, and deal 1 damage to your opponent! - At the end of the battle that this card attacked, you may put this card from the field into the drop zone. If you do, [Transform] into up to one 《Galaxy Exalt》 from your hand by paying its [Transform] cost. - When this card enters the field or you [Ride] into this card, put up to one 《Weaponry》 from your deck or drop zone into this card's soul. If you looked the deck, shuffle it. - All 《Galaxy Defense Team》 on your field cannot be [Rest] by your opponent's card effects, and they get critical+1, and [Penetrate]. - When this card enters the field, if you have another 《Darkhero》 on your field, destroy a spell on your opponent's field. - At the end of the battle that this card attacked, if you have a 《Darkhero》 item equipped, you may return this card from the field to your hand. If you do, put the top card of your deck into your gauge, and draw a card. - If you are [Transform] into a 《Galaxy Exalt》, this card gets critical+2, and cannot be destroyed, or [Rest], by your opponent's card effects. - When this card deals damage to your opponent, draw a card. - When this card attacks, if you are [Transform] into a 《Galaxy Exalt》, you gain 2 life! - All of your 《Mobil Aerial Team》 cannot be destroyed by your opponent's effects and their effects cannot nullified by your opponent's effects. - If there are 0 cards in this card's soul, this card gets [Weaponry Link]. - All 《Galaxy Defense Team》 on your field get power+2000, and defense+2000. 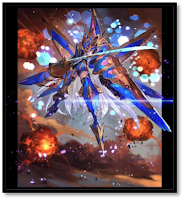 - All 《Galaxy Exalt》 on your field cannot be destroyed, and their abilities cannot be nullified, by your opponent card effects. This ability cannot be nullified. - Put the top card of your deck into your gauge, and put up to one "Galaxy Exalt, Cosmoman" from your deck into your hand, and shuffle your deck. You may only cast "Cosmoflasher" once per turn. - Put total of up to two 《Mobilr Aerial Team》 and 《Weaponry》 from your drop zone to hand. You may only cast "Daily Life of Sky Mech Mechanic" once per turn. - [Counter] Call a 《Mobile Aerial Team》 monster from your drop zone by paying its [Call Cost]. You may only cast "Fly Down Blue Sky" once per turn. - [Counter] Nullify the attack. Then, you may pay 1 gauge. If you do, you gain 3 life! - At the beginning of your turn, you may pay 1 gauge. If you do, you gain 4 life! - [Counter] 【Act】 Pay 1 gauge. If you do, call a "Deer Garden Temple, Gold Kinkaku & Silver Ginkaku" from your hand or drop zone without paying its [Call Cost]. Then, put this card into its soul. - At the beginning of your turn, choose a card on your opponent's field, and you may pay 1 life. If you do, destroy the chosen card. - [Counter] 【Act】 Pay 1 gauge. If you do, call a "Magnificent Deity, Budou Gander" from your hand or drop zone without paying its [Call Cost]. Then, put this card into its soul. - At the beginning of your turn, choose a 《Battle Building》 from your drop zone, and you may discard a hand card. If you do, put the chosen card into your hand. - [Counter] 【Act】 Pay 1 gauge. If you do, call a "MST, Mc Harry Messer" from your hand or drop zone without paying its [Call Cost]. Then, put this card into the soul of that card. - All 《Superhero》 and 《Superheroine》 on your field cannot be destroyed by your opponent's monster effects. - When a 《Superhero》 or 《Superheroine》 on your field is returned to hand, you gain 2 life, and draw a card. This ability only activates once per turn. - You may only [Set] one "Rose of White Cloth, Frill Roses" on your field. - When you [Transform] into a card with "Caardian" in their card names, put the top card of your deck into this card's soul, and you gain 1 life. - All cards with "Caardian" in their card names on your field get [Penetrate], and they get power+2000, defense+2000, and critical+1 for each card in this card's soul. - When a 《Mobile Aerial Team》with this card in its soul attacks, and destroys your opponent's monster or deals damage to your opponent, drop one of your opponent’s gauge. - [Counter] 【Act】 During your turn, you may put this hand card into the soul of a 《Mobile Aerial Team》 with [Weaponry Link] on your field. If you do, deal 1 damage to your opponent! - When a 《Mobile Aerial Team》 with this card in its soul attacks, destroy a card on your opponent's field. - [Counter] 【Act】 During your turn, you may put this card from the hand into the soul of a 《Mobile Aerial Team》 with [Weaponry Link] on your field. If you do, you gain 1 life! - If your opponent has 6 or less life and you are [Ride] of a 《Battle Building》. - Deal damage to your opponent equal to the types of 《Battle Building》 in your drop zone. - If you have a card with "Zetta" in its card name on your field, this card gets power+4000, defense+4000, critical+1, and this card cannot be destroyed by your opponent's card effects! - When this card attacks, you gain 1 life, and draw a card. - You may use <Hero World> and <Generic> cards.